This ungainly fowl has seen better days. But he’s still got the perfect amount of creepiness your Halloween decorating scheme needs this year. Formerly ebony, now just bony, the skeletal raven will perch creakily over your chamber door and anywhere else you want it in your Halloween décor – at the entrance, atop the shutters, amid the pumpkins, among the snacks. And if you think just one lonely raven is creepy, just think about what decorating with an entire unkindness of them (yes, that’s what ravens in a bunch are called, an “unkindness”) will add. The stately raven is made of sturdy, molded plastic to make sure it will stay sitting, never flitting, wherever you perch it. 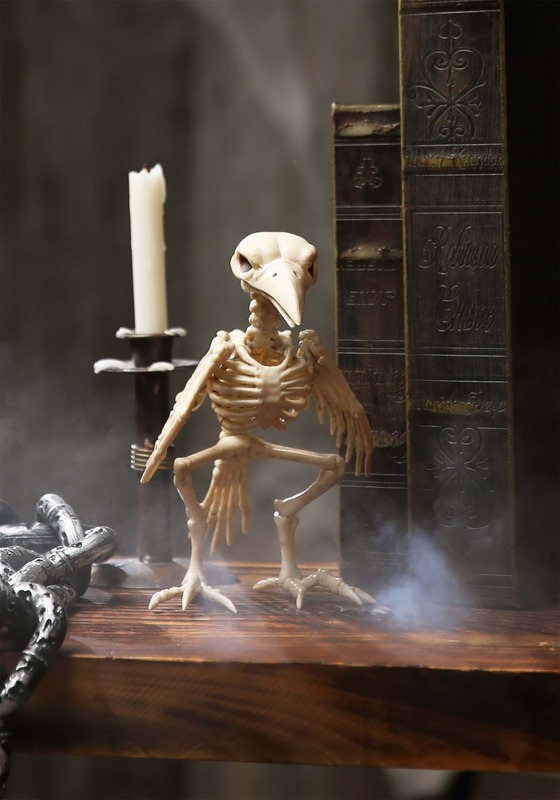 And this is no little bird – the raven is a full 8” tall to fill your party with fantastic terrors. Its beaky skull and featherless wings rotate ever so slightly for ever more spookiness.